What do you do when you have the entire catalogue of an artist, the ‘Best of’ albums, most titles on at least two formats, plus a goodly selection of bootlegs? If you answered, ‘See your therapist’, you get points plus that special superior feeling that attends the suspicion a fellow music lover may just be more deranged than you. If you said, ‘Buy anything with the artist’s name on it’ you get points as well, but the superior feeling might be a bit tenuous. Recently I reviewed Discoballs: A Tribute to Pink Floyd, a 1980 curio by studio outfit Rosebud, and was delighted to find several readers promptly endorsing the purchase and even expressing mild envy. Today we feature two further discs in the Vinyl Connection Collection with the words Pink and Floyd on the cover, yet neither are by the band. Keyboard player and orchestral arranger Dee Palmer (formerly David Palmer) made a first appearance in popular music arranging for Bert Jansch on his 1967 album Nicola. A little later a connection was formed with Jethro Tull, Palmer filling the role of arranger on nine albums beginning with debut This Was and concluding with the ghastly Too Old To Rock ‘n’ Roll in 1976. But that was not the end of the Tull connection as Palmer became a full-time member for four albums beginning with Songs From The Wood. 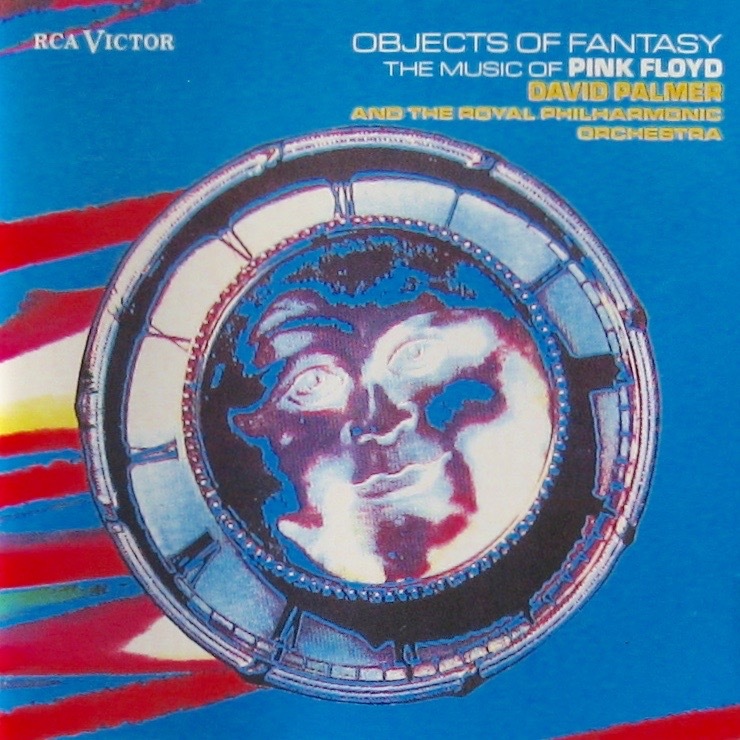 Objects of Fantasy: The Music of Pink Floyd, released on classical label RCA Victor in 1989 (credited to David Palmer and The Royal Philharmonic Orchestra). Now you may have read bad press about orchestral albums of rock music. Indeed, you may have heard it from me. Yet overall, I’d have to say that Objects of Fantasy isn’t bad at all. The arrangements are varied and clever, highlighting those aspects of each song that most reach out to the listener. On “Goodbye blue sky” for instance, the use of a small choir (including Floyd alumnus Clare Torry) polishes up the pretty melody nicely, while the orchestral fade-in (and studio effects) on “Money” are grand. When the drums kick in, accompanied by horn stabs, it’s all rather exhilarating. It is also fair to say this track also shines a light on one of the main weaknesses of orchestral rock. String sections just aren’t punchy enough to grab you by the collar and shake. Still, this one tries pretty hard and Phil Todd’s sax solo is great – respectful without being entirely slave-ish – leading into a tasty guitar solo. Guitarists, incidentally, are listed as Mitch Dalton and Steve Hackett#. “Wish you were here” is a funny one. It uses brass to state the main theme, then the horns offer counterpoint to the strings recapitulating the same phrase. It all sounds very Magical Mystery Tour and brings a smile below a slight frown that someone is messing around with this classic, melancholy song. The brief synth voicing is lovely… then the bloody French Horns charge back for another tilt at the melody. Perhaps this track demonstrates both best and worst of this type of project – part new light through old windows, part velvet-wrapped brick through plate-glass. Anyway, it’s exhausted me. Time for a lie down. Somewhere around the time that the boy was conceived, some bright musician on the other side of the world came up with the idea of turning rock ‘classics’ into lullabies. The Rockabye Baby series of CDs was duly born in 2006, transforming (the cover asserts) “timeless rock songs into beautiful instrumental lullabies”. How do they sound? Well the blurb tells you. “The soothing sounds of the glockenspiel, vibraphone, mellotron, and other instruments will lull your baby into a sweet slumber”. Sure, but not real glocks, vibes and synths. Just voices on a modern electronic keyboard, one that blends all timbre and melody into a tinkly mush. This is aisle music for the Baby Heaven Supermarket. How many Floyd references did you pick there? My, now those copywriters must have chortled at their own cleverness. Pity they couldn’t work “Us and Them” into the pitch. Again, how does it sound? Like tinkly New Age massage music, of course. Glance back at those featured instruments: all upper register, all blessed with celestial sustain, all as edgy as mashed banana. Structurally, the arrangements are relatively faithful to the original songs, but with Pink Floyd songs the melodic range is pretty limited anyway so when you add in the sameness of the tonal palette, the result is just bland. Which is, perhaps, the whole point. “Hey You” stood out due to the triplets used in the accompaniment while “Mother” caught my attention mainly due to the contrast between the plaintive whining of the original version (veteran readers will know that we are not overly fond of The Wall here, unless it’s being used as a form of attack) and this ostensibly soothing rendition. Final track is “Brain Damage” from Dark Side. Just what you want for your child, really. 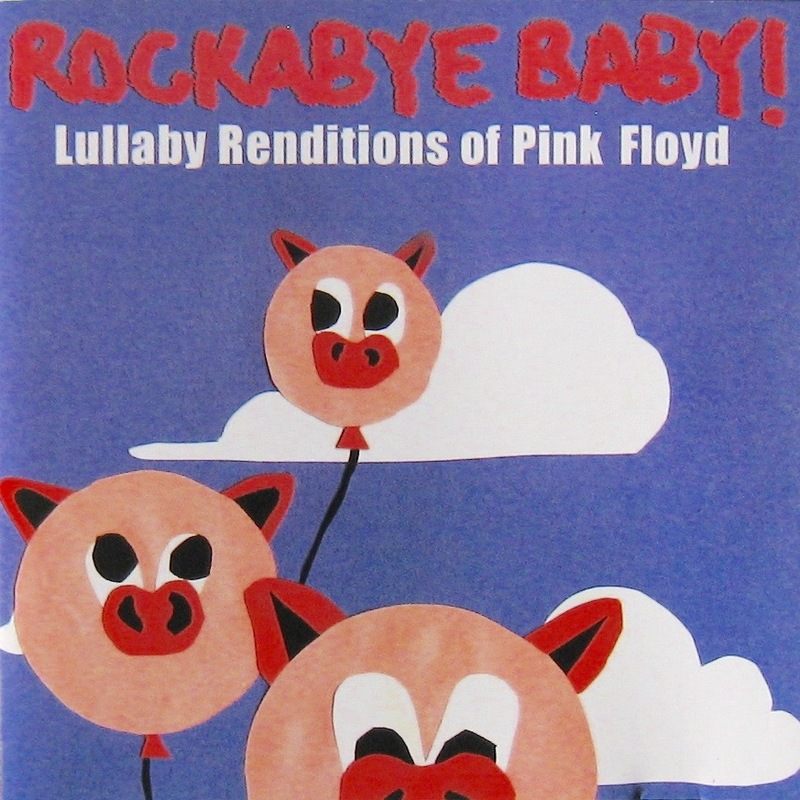 So Lullaby Renditions of Pink Floyd was not on high rotation in our nursery, nor anywhere else. Yet it still sits on the shelf in the section marked ‘Floyd Oddities’ (or Floyditties for short). What is more, if I saw certain other titles in the Rockabye Baby series at the right price, temptation would flutter. Thinking I really must be brain damaged? Maybe. But if you could resist lullaby versions of the Ramones or Black Sabbath you’re a stronger person than me, baby. # For those less obsessed with prog than Vinyl Connection, Steve Hackett was an integral part of the classic Genesis line-up and has a string of interesting solo albums to his credit. This is also the point where I sheepishly own up to buying this disc purely because of Hackett’s name in the credits. I am feeling a little envious of at least one of these. You found the right words, as always, VC. “New Age massage music … as edgy as mashed banana” – love it! Perfect for when you’re a bit peckish and have a relaxation massage lined up. I turned the second one down – quite low (or ‘off’ as it is known around here). It seems grand-parental status has not softened me enough for ‘Mother’. [And perhaps a week of repeated loud baking under Freddie Hubbard’s ‘Red Clay’ has hardened me up too much for a P’Floyd lullaby tonight]. Isn’t Red Clay fantastic! So much more substantial than warm mush! ‘Red Clay’ is my favourite album at the moment, a close second to ‘No room for Squares’, a title which might also preclude Floydite-mush. But of course I needed Mingus to get through last week. Glad to hear the time on the couch produced some sort of result, James. To be honest, all good collections need some curios, don’t they? They sure do. I have a couple – my favourite being the Torero Band’s Tijuana brass renditions of The Beatles. Did not know the D. Palmer / Tull connection, and really love the three JT albums from Songs from the Wood forward, so I still have to view Objects of Fantasy positively even if I don’t open the wallet. With you on the vocals. In many ways the human voice is the most defining aspect of most popular music. Like that image of the ‘bigness’ of the music – that’s orchestras for ya! I think Dee Palmer is a marvellous arranger; able to subvert their own ego in the service of the music. I’ve been meaning to spin Bert Jansch’s Nicola ever since beginning the post but haven’t got there yet! Me memory was of disappointment due to the strings, but context is all (as my Gestalt colleagues say) and after dipping into his work a bit, perhaps I’ll enjoy Nicola more as a result. And that string of Tull albums is, as you say, excellent. Thanks for another thoughtful contribution, V.
I have an 8 month old boy. All the “classic rock lullaby” stuff is garbage. I get the intrigue, I really do, but they’ve always put me in a state of odd frustration. It is just Muzak, but meant for you to actually listen to, not just hear for 30 seconds and chuckle at. Classic rock melodies just don’t sound good this way, that’s why they’re played with guitars and not vibraphones. The Baby Einstein discs that do this with famous classical works are much much better. I kinda feel like these things are knocked out in a couple days and are obviously way more for the parents, but even if I get any mild enjoyment out of them I would much much rather hear the real thing. By the way, my kid seems to appreciate “adult” music (like Stevie Wonder) way more than this watered down kids stuff. They have these stuffed turtles that play lullabies on a loop, you don’t even have to be in the room. I’d get that!! What a great word, “intrigue”. It captures that quiver of expectation and hope when fans find a connection with new music associated with a revered artist. But muzak is exactly what it is, and good on you for not polluting your little one’s ears with such mush. Having said that, some effort certainly went into the packaging. The cover is really rather nice, and although it is cloying in the extreme, the inner sleeve is mildly amusing. Pity about the music though. So keep playing the Stevie Wonder, or whatever makes YOU and other relevant adults happy. That’s what’ll rub off on the babe. We played Miles Davis‘ In a Silent Way almost every night in the third trimester and, ten years later, the boy shows very sign of being less deranged than his Father. Result! I expect you know of Luther Wright and the Wrongs bluegrass-flavoured “Rebuild the Wall”. It’s a bit zany, but well-intentioned and competently done. Heard of, yet never heard. Would probably shell out for, though!